​Recorded at an impromptu live in concert at The Artistree in Woodstock, Vermont Jan. 18, 2013. David Kraus on nylon string guitars, and John LaRouche on chromatic harmonica and Native American wooden flutes. Both musicians each compose and arrange their own music for the duo, and collaborate on other musical pieces. David Kraus on nylon string guitar with John LaRouche on chromatic harmonica & wooden flutes play original arrangements of the great jazz and latin composers from Duke Ellington, Thelonius Monk, Horace Silver, Carla Bley, Jerome Kern, Johnny Mercer, Louis Bonfi, Toots Thielman, Antonio Carlos Jobim, Chick Corea, Vinicius de Moraes, and more, through Lennon & McCartney, Roberta Flack, Stevie Wonder and beyond, in addition to their own attractive and engaging compositions. Their music sings through a rarely heard instrumental coupling infused with dynamics and sensitivity, space and energy, feeling and emotion, and an able sense of improvisational curiosity. 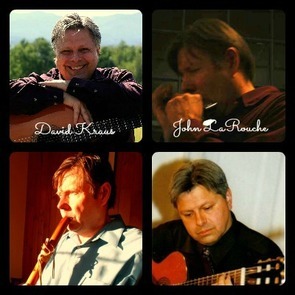 With decades of professional experience and drawing from a wide palette of musical forms including jazz, blues, classical, pop, folk, Eurojazz, and world idioms, the duo's creative take on the modern jazz songbook and their own ear pleasing creations can surprise and delight with unexpected tonal colors and rhythmic shifts. With a skillful use of composition and song crafting, each piece is given shape, guiding listeners onto an open sonic canvas where the artists may freely paint with shades of American, Spanish, North African, Brazilian, Middle Eastern, European, even a hint of Hindustani as they reveal their musical visions, each with its own story to reveal. The tracks here are rough mixes recorded into the soundboard and not for sale. Their purpose in being posted here are to be sample music tracks for the purpose of showing an artistic work in progress which is moving toward the completion of a full CD project comprised of wholly original material in the Autumn of 2013. In addition, they are sample tracks for the purpose of entering a variety of music festivals and venues, and for private affairs bookings. Feel free to contact me. To the right there are some descriptions of the tracks found on the music player. I'm hoping they may give you an idea of what I am designing this section to be, which is a place for ideas and possibilities. As of yet, this collection of roughly mixed guitar pieces is not a fully conceived recording project. It is rather, a sampling of tracks I spontaneously recorded in my studio over the years, which to date just never coalesced into a CD. Some, from quite a while back, were recorded on magnetic tape, while others were done digitally. Differences in tonal aspects, volume, and EQ on the tracks is apparent because final production has not been done. I put them up here to show variety in what I do as a musician, document my background found in my Bio, and for fun. Now that I am settled in my new home of Philadelphia and my studio is up and running, more music will be coming soon. The tunes posted so far are mostly standards in the jazz repertoire. "Joy Spring" is a great composition by the legendary trumpeter Clifford Brown. I recorded this in 1990 as an overdubbed duet with myself, as I also did with another great piece "A Child is Born" by yet another great trumpet player, Thad Jones. Paul McCartney's "Yesterday" is heard a short solo on nylon string guitar, as is the wonderful Duke Ellington/Billy Strayhorn composition "In A Sentimental Mood." 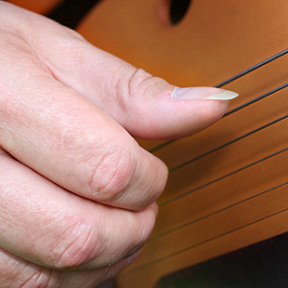 The "Caprice" is from the Spanish guitarist and composer Manuel Carcassi. And "Little Girl" is by my late friend, pianist and composer Andy Shapiro from his album "Dig Deep." The song was written for nylon string guitar (me) and vocals (Andy) with some synth melodies intertwined. With a bit of editing it has become a nice little guitar piece with a synth interlude. All of this music has been recorded over a very long time span from 1990 through the last few years. Some of the music isn't jazz at all, but are just sounds that struck me in the moment, and I felt the impulse to switch on the mics and play. It's not much different I think from a writer keeping a journal of sorts.